Various petrochemical plants had to conform to Environmental Protection Agency (EPA) regulation Subpart Ja for added temperature monitoring of the Flare Stack for sulfur emissions monitoring. 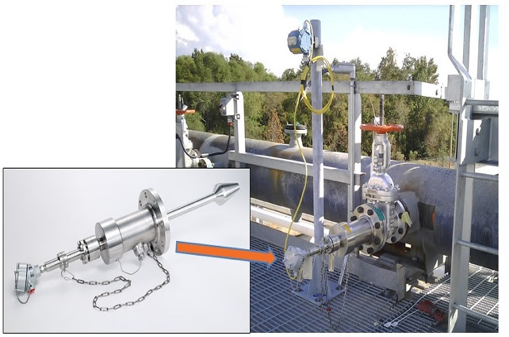 This required several plants to hot-tap a new branch nozzle into the flare stack to provide a means for inserting the temperature sensor through a process isolation valve without interrupting production. Conax’s RSA with a Retractable Tapered End Thermowell was designed to rigidly support the tapered end into the hot-tapped hole of the Flare Stack. It is designed to survive a flare stack event with gas velocities up to 375 ft/sec (256 miles/hr) at 50 PSIG at 850OF. The design includes a retraction nozzle with bleed port to ensure the tapered end clears the process isolation valve and allows for bleed-off of the process gas. The retractable design is made possible with the use of Conax Technologies’ Seal Fitting. Conax’s RSA combines our capabilities for Temperature Sensors with our Retractable Sample Probe Assemblies (SPA) to provide our customers with an optimum solution for Retractable Sensor Assemblies.